This blog entry about the events of Thursday, July 11, 2013 was originally posted on July 21, 2013. PART 7 (DAYS 14-17): “Things could be worse, right?” I told Ally, California-native who worked for the Papua New Guinea Tourism Promotion Authority (in LA), who had organized the press junket I was traveling to PNG for. Little did we know at the time, that the first three-day part of the junket’s proposed itinerary would be canceled (due to a missed chartered flight connection to Tufi), and have to be replanned on a whim, based on whatever activities or accommodations were available in and around PNG’s gritty capital city, Port Moresby. Along with me and Ally was Tina and Emily, both of which I knew in some friendly, non-professional capacity before going on the trip, which made the junket feel less like work, and more like a trip with a few friends — you know, my kind of people who would rebel against the law by sitting in a No Sitting area or sleeping in a No Sleeping area. “How much money are you taking out?” I asked Emily as we tried to get money from one of the ATMs in Jacksons International Airport (POM). “[I think I should take more out,] because,” she answered before a pause. “I drink a lot.” I knew I was in good company; the night we’d met in New York a few months prior through travel/food writing circles, we’d had an impromptu night at a bar, pounding glasses of scotch way longer than anticipated. 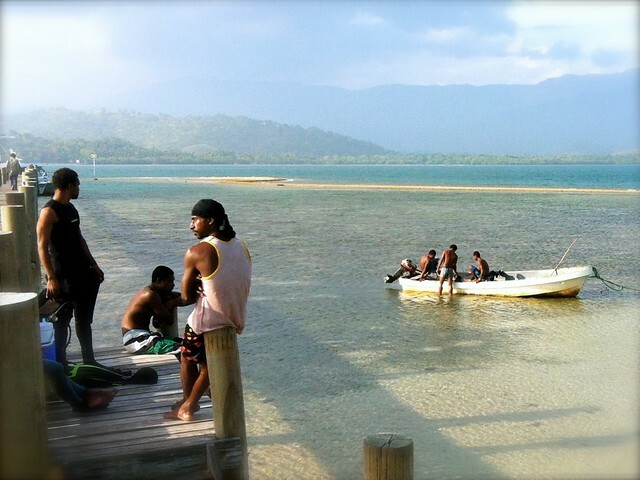 Emily was able to take money out, but I couldn’t (nor could the other freelance journalist Tina), which was only one item of the on-going list of travel mishaps that first day in PNG — so many that you couldn’t help but laugh at it all. ATMs didn’t dispense cash. No alternative flights to the remote region of Tufi, where we’d miss out on staying with a family, and going night fishing with local men. The keycard to my first hotel room in Port Moresby didn’t work. My new room’s safe was broken and couldn’t lock things. And worst of all, the refrigerator that was meant to keep drinks cold in the hotel convenience store wasn’t working, and the much-needed beers were all warm. “I think the question is, what do you they have available?” I interjected. Our last minute accommodations were at the Holiday Inn Express, which was bigger than an American motel-style version, with comfortable beds, a pool and poolside bar, and even a questionable dental center. However, there were some disconcerting (and therefore quirky) elements to it, like the plaster patchwork in the dim hallways, and the fact that they never erased the pencil lines on each door when they needed to align and hang the room numbers. Also, it was funny at the airport when we figured out that was going to be our home for a couple of nights, and an airport employee simply put on a Holiday Inn uniform shirt to suddenly be a Holiday Inn employee, to put our bags in our minivan transport. When we left, he changed back into his airport employee shirt. “I had this plan where I was going to surprise you tonight [in Tufi],” Ally told the rest of us when we’d finally settled down to night time drinks and dinner that first evening in Port Moresby. “Well, now you can surprise us with dental work,” I joked. “I was just thinking I should probably get some dental work done,” Emily said. “Thanks for rolling with the punches, guys,” Ally apologized, although it was hardly necessary. We all knew what we’d signed up for; unlike many press trips with overly organized (and often rushed) itineraries, you really can’t overplan in advance in PNG because it doesn’t really have a strong tourist infrastructure (yet), and with the way some things run in such a carefree manner, anything can happen. Ally had specifically chosen our group amongst other applicants, not only for our press credentials, but for our easy-going Type B personalities that could handle such an on-the-fly junket without complaining. She herself was a dynamo of cool, transforming mishaps into good humor, never getting stressed out (or at least not showing it) about having to come up with a contingency plan. “I can safely say it all goes up from here,” Ally reassured us. The Holiday Inn Express tied us over for two nights, until we upgraded for one final night at the tastefully-designed, airplane themed Airways Hotel (where Bill Clinton once stayed), an upscale showcase resort overlooking the runway, where our former hot breakfast buffet was only outdone by an omelet station and coconuts to drink out of. LIKE MOST HOTELS IN PORT MORESBY, the Holiday Inn (Express) and Airways Hotel mostly cater to the business traveler. (In the plane used as part of the architectual design of the Airways Hotel is a business internet lounge.) Port Moresby is not just the seat of the Papua New Guinean government, but a hub of industry and commerce for foreign investors, most coming from nearby Australia. Like Calgary, PNG has oil refineries and therefore many energy companies have a presence — not only for petroleum, but for copra, which can be used for coconut oil energy. All the business offices and hotels are situated within gated, guarded compounds because Port Moresby doesn’t exactly have a good reputation, and from what we’d seen (and the reports of a few Chinese businessmen being stabbed a couple of weeks prior), that was quite possibly true. As a foreigner, it isn’t recommended to walk around, especially at night, but everything is spread out enough, you’d need a car anyway. By day, the city didn’t look so bad. It was more or less, like many dusty capitals in developing nations I’ve been, like Kampala or Dar es Salaam. Dusty roads, crammed PMVs (Public Motor Vehicles), burning grass and garbage, scattered litter, and stray dogs were all a part of a nostalgic, off-the-beaten-path charm for me, and I felt like I was back in sub-Saharan Africa or something. Port Moresby and its environs gave off a vibe that was Caribbean-like — not in a resort package tourism way I mean — but with a real, relaxed island feel, and a people looking of African descent. Some roads were aligned with makeshift vending shacks made of wood and corrugated tin, while some roads were under construction by men rolling wheelbarrows while wearing flip-flops. Naturally, our day trip to Loloata included conversations over a delicious fish lunch with owner Dik, followed by “middayers” (as opposed to “sundowners”) of SP (South Pacific) beer. (In fact, there were “middayers one” and “middayers two.”) Back in Port Moresby that evening, Dik continued to play host by taking us out to dinner at the Magi Seafood (Chinese) Restaurant with his Papua New Guinean wife Nancy and their two boys Angus and Nathan. Waterfront Foodworld. “You can really gauge a country by going to its supermarket,” Ally told us. “Besides, I need to get toothpaste.” A drive through Port Moresby’s downtown area, and along its beach, revealed the city’s relaxed grittiness. Cranes flanked the harbor to load up waterbound vehicles of industry. Nearby was the big supermarket Foodworld, which at the time, was having a “Month of America” sale, with new items from the States, including Jif peanut butter, Planters peanuts, Langers juices, and Kellogg’s cereals. I opted to get some PNG-made coffee and No. 1 tea; Ally got some health food (and her toothpaste). Emily wandered the aisles on her own, which we referred to as “snorkeling;” whether she was in a supermarket or actually snorkeling in water, she was always excitedly wandering away from the rest of us. “Look at those kids, they’re totally getting ready,” I said, pointing out kids on a playground, oblivious to our conversation. The Pacific Games are like a regional Olympics with Olympic type events, but we invented new sports to get ready for: stone skipping, rock jumping, blind high-fiving (with your eyes closed), and the one where you skillfully pour water from one water bottle into another without spilling. “Ohh… gettin’ ready! Gotta get ready for the games…” The most prominent event for the games we conjured up was “can standing,” based off a party trick that I taught Dik’s son Angus after dinner one evening. Basically you balance yourself on an empty soda or beer can with one foot, holding your body steady so you don’t crush it. Then with all the downward pressure from your weight, simply tapping the side will crush it in an instant spectacle of your mad skills. Can standing became a fun thing to teach the other kids, as well as our little group; in fact, Tina and I stepped it up by trying to do syncronized can standing, which is easier said than done. Other on-going jokes included my obsession of using juicers to produce pulp instead of juice and using it for things like popcorn seasoning, and mentioning anything, whether it’s cute or not, followed by going “Aww…” (like you might have heard on Portlandia). “Rice cooker, awww.” “Misinformation, aww.” We also realized that Emily’s brain was a resource for old TV theme songs, even for shows like Thunder in Paradise (starring Hulk Hogan). Humming and singing lines from TV themes evolved into singing actual songs. I mentioned how I once sang George Michael’s “Last Christmas” over and over as requested by the staff of a yurt camp in the middle of the Mongolian highlands, and we vowed that we wouldn’t part ways until we had a karaoke session together. “I HOPE THEY DON’T CANCEL THE FLIGHT,” our Papua New Guinean liaison Daphne told me as we sat next to each other on the outbound plane that would finally take us out of Port Moresby to the jungles of the Sepik River in the northwest of PNG. It was the originally-planned second leg of the press junket, but we seemed to have hit a snag: one of the crew members who was to support the flight simply didn’t show up for work, and Air Niugini was scrambling for a replacement. We were delayed an hour, but eventually we made our way out of the gritty capital to see more of Papua New Guinea as planned. What was going to happen next we didn’t know; all we knew was that anything could happen, and it probably would. When our lunch took about forty minutes to arrive at the Kokoda Trail Motel restaurant after our hike, the younger kids with us showed their boredom and impatience by putting their hands over their eyes — mostly to hide the one tear that was dropping from the side. It’s an gesture that we learned to do ourselves in similar scenarios of boredom and disgust. This blog post is one of fifteen travel dispatches from the trip blog, "The Global Trip: Cowboys, Duk-Duks, and Kiwis," which chronicled a five-week trip through the Canadian Rockies, followed by Calgary's Stampede rodeo festival, an assignment through different regions of Papua New Guinea, and a wintery jaunt to New Zealand's South island.